WASHINGTON — NASA can't survive without strong partnerships with private space companies, the space agency's chief, Charles Bolden, said today (Feb. 9). NASA welcomes the synergy between the public government and private sector, particularly as the space shuttle program comes to an end, Bolden told an audience of hundreds of commercial spaceflight industry professionals, government employees and space enthusiasts here at the 14th annual FAA Commercial Space Transportation Conference. "NASA has always thrived on innovation. Industry has been our partner since inception," Bolden said. "We have never built a big rocket. It has always been a NASA/industry team." 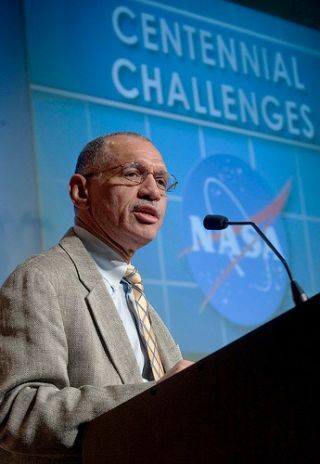 As one of the opening speakers for the two-day conference, Bolden outlined NASA's two main goals: to allow access to low-Earth orbit and to continue space exploration. Opening up low-Earth orbit and making it accessible to commercial launch providers will be especially crucial once the space shuttle fleet is retired this year, he said. "When I retire the space shuttles, that's it for NASA access to low-Earth orbit – we need you," Bolden told commercial space industry members. "We cannot survive without you." In his opening remarks, George Nield, associate administrator for commercial space transportation for the Federal Aviation Administration, took the audience back to May 5, 1961, when President John F. Kennedy's challenge to land an American on the moon before the end of the decade fueled NASA's Apollo lunar landing program. The events of 50 years ago are not unlike today, Nield said, and similar politics, interagency challenges and budgetary concerns are being faced by NASA and the growing private sector. "I guess the more things change around here, the more they stay the same," Nield said. But the mounting presence of the commercial industry is already a sign of a key difference, he added. During the Apollo age, "industry didn't really have a seat at the table. My sense is that all that is about to change – big time." President Obama's new national space policy advises NASA to purchase and use commercial services to deliver cargo and crew to low-Earth orbit. There is also an emerging commercial market for reusable launch vehicles, to be used on suborbital flights for everything from science to space tourism. "When it comes to commercial space, I'm not sure we're at the tipping point, but we're close," Nield said. Nield represents part of the regulatory arm between the public and private sector, and he said the FAA needs to be open to innovative approaches from private developers while continuing to uphold the administration's safety record. The FAA also needs to assist in finding the right amount of government assistance in the private arena – moderating between too little and too much government help. "It's very important for us to find the right balance," Nield said. "With either extreme, everyone loses. We need to find the sweet spot. I'm confident we'll find it." According to Bolden, NASA is more than willing to do its part. "We are big fans of commercial space," he said. "This industry is going to change things for this country."